Charles James Lewis (1830-1892) was a popular and prolific painter of genre and domestic scenes. He often painted on a smaller scale depicting natural and attractive scenes featuring children as the focal point. 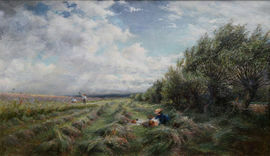 Lewis was a regular exhibitor at the Royal Academy (1853-1890) and at the British Institute, the Society of British Artists, the New Watercolour Society, Grosvenor Gallery, and the New Gallery amongst others. He was elected a member of the RI in 1882.